Nozzle material selection depends on the abrasive you choose, how often you blast, the size of the job, and the rigors of the job site. Here are general application guidelines for various materials. Aluminum Oxide "Alumina" Nozzles offer good service life at a lower price than other materials discussed here. They are a good choice in low usage applications where price is a primary factor and nozzle life is less important. Tungsten Carbide Nozzles offer long life and economy when rough handling can't be avoided and mineral and coal slag abrasives are used. All tungsten carbide nozzles are not equal. Note that all Boride tungsten carbide nozzles feature top wear grade material and thick-wall construction. Silicon Carbide Composite Nozzles offer service life and durability very near tungsten carbide, but these nozzles are only about one-third the weight of tungsten carbide nozzles. Silicon carbide composite nozzles are an excellent choice when operators are on the job for long periods and prefer a lightweight nozzle. Boron Carbide Nozzles provide longest life with optimum air and abrasive use. Boron carbide is ideal for aggressive abrasives such as aluminum oxide and selected mineral aggregates when rough handling can be avoided. Boron carbide will typically outwear tungsten carbide by five to ten times and silicon carbide by two to three times when aggressive abrasives are used. These are estimated values for comparison only. Actual service life will vary depending on blast pressure, media size, and particle shape. Tungsten Carbide Liner With 1-1/4" Fine Thread Or 50 MM Coarse Thread. Air Induction Holes In Jacket Increases The Blast Stream Velocity. Excellent For Plastic Or Agricultural Abrasives. Silicon/Tungsten/Boron Carbide Liner With 1-1/4" Fine Thread/50 MM Thread With Acetate, A Hi-Tech Engineering Plastic, Specially Formulated To Provide A Strong, Lightweight, Shock Absorbing Casing For The Liner. Tungsten Carbide Lined Long Ventui Flanged Nozzle. Tungsten Carbide Liner With 50MM Contractor Thread And Duragrip Sleeve. Silicon Composite Liner With 1-1/4" Fine Thread & Yellow Duragrip Sleeve. This Latest Advance In Nozzle Technology Is Ideal For The More Aggressive Media And Outperforms By Far The Properties Of Silicon / Silicon Nitride Nozzles. Tungsten Carbide Liner With 1-1/4" Fine Thread Or 50 MM Coarse Thread With Acetate, A Hi-Tech Engineering Plastic, Specifically Formulated To Provide A Strong, Lightweight, Shock Absorbing Casing For The Liner As Well As Durable Threads. 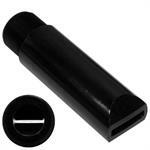 Tungsten Carbide Liner With 1-1/4" Fine Thread. The Square Shooter Blast Nozzle Production Rate Is Faster Than The Conventional Long Venturi High Production Nozzles. The Square Shooter Nozzle Requires Only A 10% To 20% Overlap As Compared To A Long Venturi Nozzle Which Requires A 50% Overlap. Tungsten Carbide Liner With 3/4" Fine Thread. Nozzles For Spin-Blast System Included In This Category. Water Induction Nozzle System For Wet Abrasive Blasting. Tungsten Carbide Liner With 1-1/4" Fine Thread. Acetal Is A Hi-Tech Engineering Plastic, Specially Formulated To Provide A Strong, Lightweight, Shock Absorbing Casing For The Liner. Curved Nozzle System Supplied Complete With 7/16" Bore Silicone High Performance One Piece Curved Liner And Brass Interconnect With Tungsten Carbide Liner In 1-1/4" And 50 MM Contractor Thread.